Is the Surface Book suitable for music production and live performance? After two months of exhaustive testing I can finally give my view on the Microsoft Surface Book as a platform for music and audio production. Spoiler – the results are good! I’ve testing all sorts of music software such as Cubase, Pro Tools, Bitwig, Studio One, Ableton Live and Sonar. I’ve run software instruments such as Arturia V Collection, Native Instruments Reaktor and Biotek. I’ve installed audio interfaces and controllers such as the Avid FastTrack Duo, Keith McMillen K-Mix, Novation Bass Station II and Circuit. I’ve run it with Ableton Link, I’ve done multi-track audio and I’ve created some terrible electronic music. And it’s all been good. It’s all behaved as it should. I’ve made a lot of comparisons to the Surface Pro 4 and I’m happy to say that the SP4 is working brilliantly as well. All the Windows updates and firmware updates since the testing I did last year have improved the performance for music making tremendously. So check out the video below for all the details. And if you want to see the detail of the tests I ran then you’ll find nearly 6 hours of content on my YouTube channel. The script I based the video on continues below. I’ve had the surface book on loan from Microsoft for 2 months. So, what have I done with it? I’ve played with Stage Light and FL Studio mobile and Staffpad. I’ve looked into toolbars, tested different hubs and drained the battery running loops in live performance. And it’s been fine – in fact, its been fabulous. I had no problems running any music software or hardware. 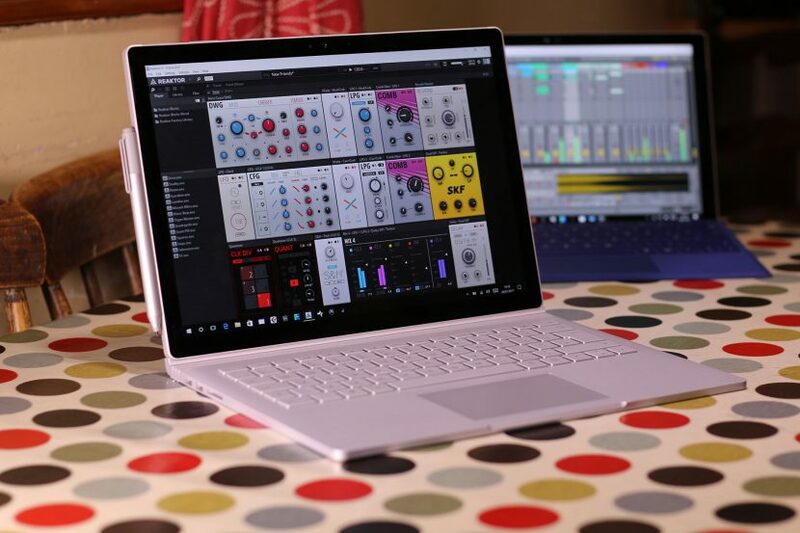 The Surface Book has a U series processor – these are designed for long battery life, low power but nippy performance for mobile devices – these are the least ideal processors for music production. Music production wants high power, high performance, always on desktop CPU power. However, the Surface Book offers other advantages in the form factor, in live performance and with interactivity that make it interesting to me and other artists. So – what I am saying is that you are not going to get desktop performance. However, what you do get is pretty impressive in my view. So, some examples for you. I could run Reaktor 6.1 all day, very easily, with Ableton Link – fabulous. With Ableton Live I was able to run a project with 8 Arturia virtual instruments and 8 instances of Reaktor Blocks with some plug-ins and samples running – no problem. In Pro Tools I had 40 virtual instruments going, including 8 Reaktor Blocks. I recorded 96 tracks of audio with 279 plug-ins before Pro Tools glitched. This is good stuff for the Surface Book i7. My Surface Pro 4 also performed brilliantly with about a 15-20% drop in comparison. So I can safely say that the problems I hit early on with the SP4 are no longer present. Now both the SB and the SP4 are totally capable of running audio software and hardware – at least in this experience here. There’s always the potential for struggle in any system but hopefully the tweaking guide and other information provided here will help you with that. So what do I think of the surface book as a device for music production? I can honestly say that I’ve never handled a more beautiful device. The feel of the keyboard and trackpad is awesome, the screen is breath-taking, the feel from the pen and the touch integration is fabulous. It has the power and stability to run decent sized projects and gives you more ways of interacting in live performance than you get with a regular laptop or MacBook. Because the touch experience is vital. The whole pen and touch aspect is what, for me, makes the Surface range interesting. Let me try to make this clear. I don’t want all touch – that can be clumsy and restricting in some areas – I want everything. I want to be able to use a fabulous keyboard and trackpad, but I also want to use touch to compliment it – or the other way around. I hear people say that such and such a piece of software is no good for touch so what’s the point – well then use the keyboard and mouse – you are not restricted. We can all use keyboards and mice with our computers – but I’ve increasingly found that trying to direct all my ideas, all my creativity through the single point of a mouse is just bonkers – it ties you up in knots. I don’t have to mouse around trying put a pointer on a fader – I can reach out and move it. With Surface – I can still single point it all if I wish – but I can also approach it differently, get my fingers in there, get the pen in there – you sit differently, your posture is different, your focus changes – and those things, in a creative space, are awesome! It’s not perfect – how could it be? There were a couple of difficulties. First of all the USB sockets in the super slim chassis made it difficult to plug in dongles. My Cubase dongle and iLok were not looking very safe and in danger of getting bent. Obviously using a hub sorts that out but it’s a bit annoying. The screen detaching, although very cool, was more of an annoyance for me. Because it didn’t take USB or power with it then as a music making tablet it wasn’t really going to cut it. You’d have to shut your audio software down when doing it because otherwise it would get into a argument over the USB audio interface suddenly disappearing. So for me, it would be better if you could spin it around like with some other hybrids. And then you have the screen wobble. It’s probably the biggest issue for me. When using the sb as a laptop it’s awesome – when folded down flat and getting stuck in with a pen it’s awesome. Where it doesn’t work so well is in hybrid mode. I am used to the sp4 where I use keys, trackpad, touch and pen all at once – whatever works. Reach out and touch the screen and it wobbles – it just does. You can minimise it with your hand and it’s no big thing with occasional prodding, but if you are used to touch – as I am – and you’re getting stuck in then it starts to become a problem. This is the point at which you go into console mode – and that’s great, but you’ve now lost the keyboard entirely. That doesn’t happen on the Surface Pro 4. And this highlights the difference between the two devices. The Surface Pro 4 was designed as a touch device, as a tablet with laptop performance. The Surface Book was designed as a laptop with touch. So, in fact, the touch experience works better on the Surface Pro 4 – in this form factor – than it does on the Surface Book. An example is that some things just don’t like touch. The save/discard button on the Roland software synths will not go away with a finger or a pen. With the SP4 I can clip on the keyboard and deal with it – even in a live situation. With the Surface Book I cannot – and actually I should probably carry at least a wireless mouse with me just in case – I can’t, in the middle of a gig take the screen off and reattach in order to use the keyboard for a second. Surface Book or Surface Pro 4? So, on reflection, for what I use it for – music production and live performance – the Surface Pro 4 is still the better option. It’s better balanced, more rigid and resists my touch. In a live situation I need the screen there, angled up for touch and interaction. The SB can’t do that. I said right back when it was first announced that using touch on a regular laptop wouldn’t be ideal – I’d push it over. And although the balance of the unit is good enough to resist falling over, the wobble is just as I expected it to be. The SP4 is simply a better design for a touch orientated device – in my opinion. I don’t need to extra graphics power, or battery life – I don’t need the laptop form factor – the SP4 is more versatile in my environment, more touchable and convertible. However, the Surface Book is beautiful – I am going to miss that screen and the feel of the keyboard and trackpad – I will miss its solidity as well – it feels solid and expensive – I would never throw it around like I do my SP4 – not sure if that’s a pro or a con actually. it’s a marvellous device if the laptop form factor works for you. One final thought and a plea to Microsoft. Please, someone, come up with a toolbar for the pen. Just a bunch of windows shortcuts. Dell have done it with their Palette software on their new Canvas touch-screen. That’s all I want – so I can copy/paste with having to faff around with right-clicking the pen…. And then perhaps do loads of other really cool stuff with it. So yeah, the Surface Book gets my unreserved seal of approval and the Surface Pro 4 is also now ready to go for making tunes. Which one to choose depends on what you’re doing and what form factor you prefer. Is the Surface Laptop and Windows 10 S any good for music production? Thanks for doing this Robin. Your videos have been really informative and helpful. It’s a shame you have to give it back. yes, Microsoft please let Robin keep his surface book! However, I find the annoyance of the Surface Pro design (I have a Pro3 from work) is that they are difficult to use ‘on a lap’. I see you tested a surface pro 4 with an i5 processor. You think the test results will reach about the same or more performance with one that has an i7? You should get a bit more – more like the Surface Book as that had the i7 processor. Ah I see. I was a bit worried as I’ve seen reports of the processors behaving differently when under load. The i7s were throttling more than the i5s I believe. I think they were older reports, so hopefully that’s been ironed out by now. Thanks for the response. Yeah, that was true of the Surface Pro 3 – the heat was problem and so you had this massive drop in performance when it got too hot. You’d hit that with the i7 quicker than the i5. With the SP4 it’s very different, the throttling is much more subtle, the cooling better and so the i7 performance is actually there to be used. Hi Robin. Thanks a lot for the great videos! As a desktop pc, with babyface pro, external drive for samples (kontakt, omnisphere) and audio recording, midi controller, mouse, keyboard and second screen, all plugged to the surface dock? Do you think it could handle it? The reason I don’t go straight for a desktop is that i do lots of scores (sibelius) and I’m excited to try Staffpad’s handwriting recognition for that. Besides, the surface pro i7 16gb ram is more power than my current desktop, so based on that it should work for my projects. Yes that could all totally work. However – be careful about CPU comparisons. The SP4 uses a U series ultra-mobile i7 processor which is nothing like a desktop i7 processor. Do a bit of googling and find benchmarks on your desktop CPU and compare them to ones on the SP4 CPU – they are very different. well, i’ve been using macs now for a decade. i’d like to try staffpad. so now, the price drop in the surface pro 4 has got me interested. basically, here is my goal: a live, wireless setup that runs my guitar and vox through the surface pro (5), and i can make changes per song, etc. i am also interested in trying out some looping — but would like to have pre-set configurations for parts of the song — so verse chorus bridge, etc. u think a surface pro 4 can handle that? should i wait for the surface pro 5? Yes, very probably – depends on the complexity of your projects and how individual plug-ins behave. It sounds reasonable to me. I use the internal drive. Unless you are tracking huge numbers of channels then the internal drive is nearly always enough. But additional drives do have their benefits, they are just not as necessary as many people are led to believe. I have a Surface Book and Surface Pro 3 in my household and I have to disagree. The Surface Book is definitely the king between the two for music production. Longer lasting battery, more screen real estate, more ports, bigger SD card slot, dedicated GPU to name a few reasons. Disagree with what? Not sure I said the SP3 was better than the Surface Book? What are you on about? Hey there, any chance you could download the pianoteq demo and see if you get cpu spikes (causing crackles) every 10 seconds or so? I just got my i5 surface book and I’m about ready to call it quits. The strangest thing is that the spikes don’t seem to have anything to do with the actual cpu usage of pianoteq. I see the spike occur (under options, and then under perf) even when the cpu load reads 25%. What audio interface are you using? Hello, I am using the Focusrite Scarlett 6i6. I’ve actually figured out the issue, and I’m not sure why/how you didn’t run into the same problem. You can see by the following screenshot that the CPU usage was only at 26%, so that shouldn’t be an issue.. but those red spikes are when the crackle and pop occur. Those coincided with the apci.sys spiking. I used an applicated called LatencyMon to track down the culprit. It was the acpi.sys Battery Monitor drivers. Once I disabled these in the device manager the problem went away completely. Of course, this means that I don’t get any battery information. So, I’m constantly having to turn them on/off depending on the task I’m performing (music = off, coffee shop work = on). It’s a pretty annoying bug on a device that carries a premium price. Note. I know that there were some bugs with the Surface Pro 4 regarding old battery drivers when the device first shipped. It appears as though my device has the latest drivers (2015-11-13) version 1.2.0.2. Thanks, Robin, yes, very gratifying indeed! So much so that I won’t be returning the device even if I’m not able to find a more permanent solution. I have the same latency issues even when the focusrite isn’t plugged in. Also, I’ve not even tried using the device for music without it being plugged in. I’m going to head into the MS store this weekend. I’ll report back if I gather anything of interest. I’ve also submitted this issue with MS Feedback along with repro steps. Who knows.. maybe someone at MS will hear it. Coul you please, please test the new Traction Waveform bundle with Collective and Biotek(synths) on Microsoft Surface Book? I’m considering this combination as my preferred ultra portable do all solution. I just can’t find any information about if these would work together. Much appreciated if you could run this test. You get 30day demo period if you download the Waveform bundle from the trackition page and login/register software on startup of the Waveform. Also synths can be unlocked for 30days demo by logging in. No I can’t, I don’t own a Surface Book, but I don’t see why it wouldn’t work. Biotek and Tracktion 7 run fine on my SP4. Yes sure, why not. It doesn’t have Thunderbolt though so you can stick with good reliable USB audio interfaces. there’s something I don’t really understand when you say the surface book cannot do this: “In a live situation I need the screen there, angled up for touch and interaction. The SB can’t do that”. I think it actually can, when you flip the screen and put it back on the keyboard you can have the touch screen in a very similar position as you can have the surface pro, and it is also rigid and resistant, I can tell because I own a surface book and I use it sometimes like that. Did I get something wrong or maybe you didn’t know about that SB feature as you wrote this review? Yes, but only sort of. In that configuration the SB is essentially flat and so you’d need an adjustable stand to get it at a decent angle – you can of course use it flat, that’s fine, but I want it up at 45 degrees and the Surface Pro is far better at doing that because of the fabulous kick stand. Almost all reviews I’ve seen of Surface Pros say it isn’t “lapable.” I don’t get that. I agree with you on this — Surface Pros are super-comfortable on the lap, more versatile, (as you say, you can sit in more positions), rock-stable when you touch them because of the stand, the heat generated by the cpu isn’t against your legs, etc. I use my Surface Pro 3 maybe 75% of the time on my lap. It’s perfect in that position. It’s not a compromise at all. I admit to being tempted by the Surface Book 2, though — I’d love that huge detachable screen for StaffPad and digital art, along with Ableton and Bitwig, of course. I thought I’d post on my experience with my new Surface Book 2. I’ve had it for almost a month now, and it’s fantastic. I got the 15″ model, 1 TB, 16 Gig. My situation is a little unusual. There’s no way I can take my music production computer off the grid. I use it for work, personal things, and my creative activity outside of work. There’s no way I could compartmentalize those things. (I teach music, so the stuff I’m working on personally often appears in my classes, etc.) So I can’t do 100% of the performance tweaks that your (excellent) videos describe. And, since my musical activities actually don’t include extremes (like, say, 50 tracks of cpu-expensive Serum tracks), what I really need is a computer that’s powerful enough to give me some leeway so I can get what I need out of it, even though I’m also getting e-mail notifications and weather map updates and all that great stuff. Conversely, I often need reasonable performance on battery power. The most typical example is my classes — I don’t want to lug around my power supply for the several hours a day when I’m presenting production examples, so I also need a computer that has enough leeway in terms of battery life, and reasonable performance under battery power, that I can do that. So I’m not in a situation where I want to tweak it to get the extremes of battery life, and I’m glad the battery life is so great that I still get more than enough. So there I am with the Surface Book 2. It’s a fantastic computer. I haven’t come close to reaching its limits. I love that things like Virtual Reality are integrated (another thing I’m working on in addition to music). It’s fantastic to detach the screen and work on some music notation or a drawing or some sketches in Bitwig. I’m really thrilled with this computer. Sorry to go on so long — just thought I’d offer a report. I spent my life’s savings on it — happy that it more than lives up to its promise. Good comments – thanks for sharing. I compose music and have recently purchased Finale v25. I currently own a hp beats audio laptop but have to use hdmi lead to amother screen. So I want a lightweight portable laptop, perhaps a surface pro. I am also a youtuber with my music and videos. Could you kindly recommend a suitable lightweight platform as I carry it about a lot and suffer with cerebral palsy and am deaf. This is a blog all about the Surface Pro – it’s what I use. I don’t have any experience with any other laptops so I can only recommend the Surface Pro as it works well for me. Sorry I can’t be more helpful. Hi Janet, sorry for my tardy reply. I use the Surface Pro so…. that’s all I can recommend. I don’t use a range of laptops or know anything about other laptops.